Following seven successful months of colliding proton beams with each other in the search for new fundamental particles, the LHC today began colliding proton beams with beams made up of heavy ions – the nuclei of lead atoms. The study of these asymmetric collisons will give physicists more precise insights into the state of the universe a few millionths of a second after the Big Bang. During this brief period, the universe was filled with all kinds of particles moving about at near light speed. The mixture was dominated by quarks –fundamental units of matter – and by gluons, carriers of the strong force that normally bind quarks into familiar protons and neutrons. In those first moments of extreme temperatures and densities, protons and neutrons had not yet formed and the quarks and gluons were bound only weakly, free to move on their own in what's called a quark-gluon plasma. Normally, physicists recreate these conditions by colliding two beams both made up of the same type of heavy ions, such as lead. But one night in September 2012, LHC physicists chose to collide beams made of two different particles for the first time – heavy ions with the less-massive protons. Analysing the data, the researchers were surprised to see in a fraction of the collisions signs of a collective expansion of the system, a sort of mini-Big Bang. This is a characteristic hallmark of lead-lead collisions, and well known to be associated with the properties of quark-gluon plasma, but it had never been seen in lead-proton collisions before. 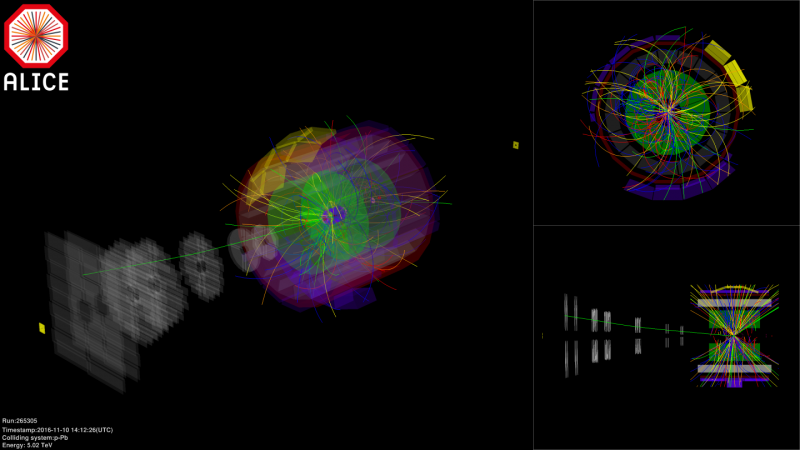 Then, in 2013, a full month run of proton-lead collisions confirmed those first observations. This year, proton and lead beams will be collided at two different energies: 5.02 TeV and, later in the month, the maximum possible 8.16 TeV. The lower energy will be equivalent to that of the lead-lead collisions in 2015, the earlier proton-lead collisions and also some proton-proton collisions, meaning researchers will be able to make direct comparisons between all three. "Proton-lead collisions are something the LHC was not originally foreseen to do, but now it has even higher physics interest than had been expected. All the experiments have joined the programme, including LHCb which originally wasn't a heavy-ion experiment," says John Jowett, the CERN accelerator physicist responsible for heavy ions in the LHC. While all the experiments will take some data, the lower energy run is being conducted mostly for the scientists at CERN's ALICE experiment, who want to collect much more data, from more events and at higher precision, to get better statistics than in 2013. "We're very excited by the possibility in this run of understanding a completely new facet of this phenomenon. Understanding how strongly interacting matter behaves in the simpler proton-lead system could actually hold the key to understanding how the quark-gluon plasma is formed" explains Federico Antinori, spokesperson-elect for CERN's ALICE experiment. Lead ions have 82 times the charge and are 206.4 times more massive than protons. Colliding these asymmetric beams, with very different properties and lifetimes, leads to many challenges for the LHC accelerator physicists and operators. A great deal of preparatory engineering work was done in last week's technical stop including special modifications to the LHC's beam instrumentation and the systems which inject the beam. "It was thought that this wouldn't work at all, as particles of different types move around the LHC at different speeds – at injection energy the lead beam is slightly slower than the protons so makes seven fewer turns around the ring in a minute (the protons make 674,729 in that time). Those problems were solved in 2012 but the beam physics and operational set-up remain complicated and somewhat unexplored territory." Jowett says. 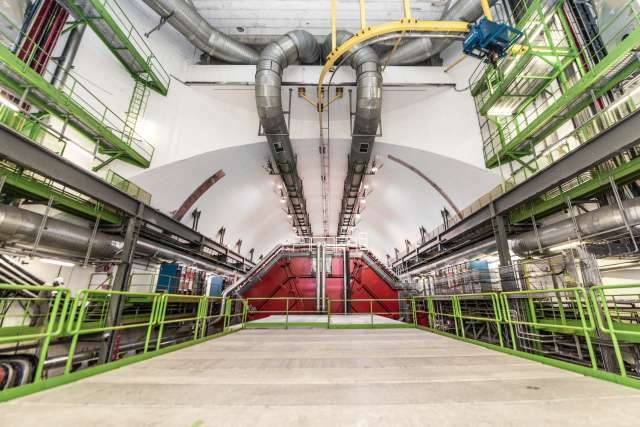 "This is the first time we've done lead-proton collisions since 2013, providing data that is important for interpreting the results of the lead-lead collisions," says Frédérick Bordry, CERN's Director for Accelerators and Technology. "It's also the last ion run until 2018."